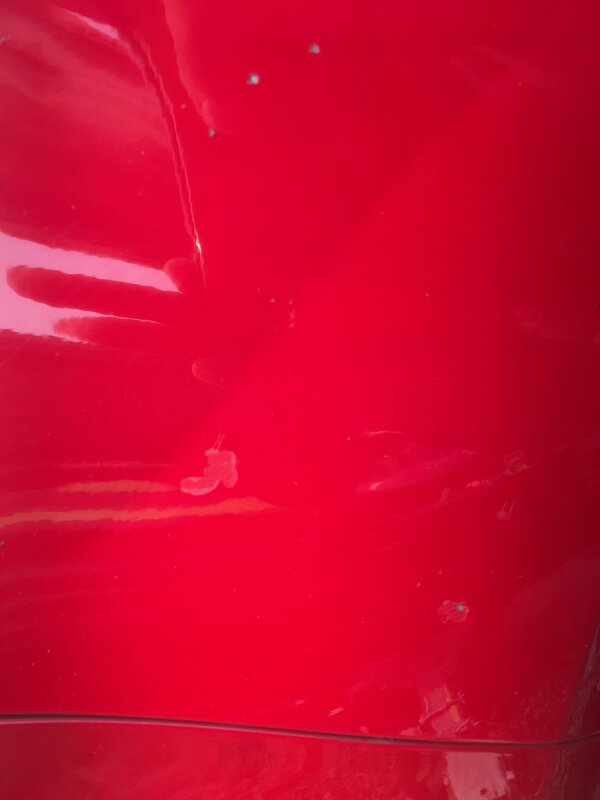 Chevy Colorado & GMC Canyon > 2nd Generation Chevrolet Colorado and GMC Canyon > 2nd Gen Appearance & Body > 2016 with 40K miles rock chips all over and peeling clear coat????!!!! 2016 with 40K miles rock chips all over and peeling clear coat????!!!! Damn....what kind of roads you have over there in Tigard? People have complained from time to time about paint thinness but, not so much about rock chips like that you're showing. Those dont appear normal at all for a 16. Could be you were just behind a vehicle awhile back that was spewing crap and you ran through a pebble storm? Just tossing that out there but, once/if you get that repaired, perhaps some of that thin clear film I keep hearing people talking about. Ive investigated it and it is a bit pricey but appears to be worth it. Ya, all mine are rock chips. I have slowly accrued them over time. I knew that they were happening but I didn’t expect it to be so many. I have like 20 or so around the entire truck. A couple I could understand. 20 in 2 years? No way! I am seriously considering the clear film for sure. But probably not on this truck. I might just get rid of it honestly because of this problem. I’m calling the dealer tomorrow. I bought the third party extended warranty and such. I’ll see what they say. But I’m reading all over the internet that people are having problems with Silverado’s and such as well. Quick google search brings it all up. I have an 11 cruze (48,100 miles) with I believe 3 or 4 chips, until 2 years or so it was my daily and paint wise has been a very reliable vehicle, boys in lordstown build em right ! 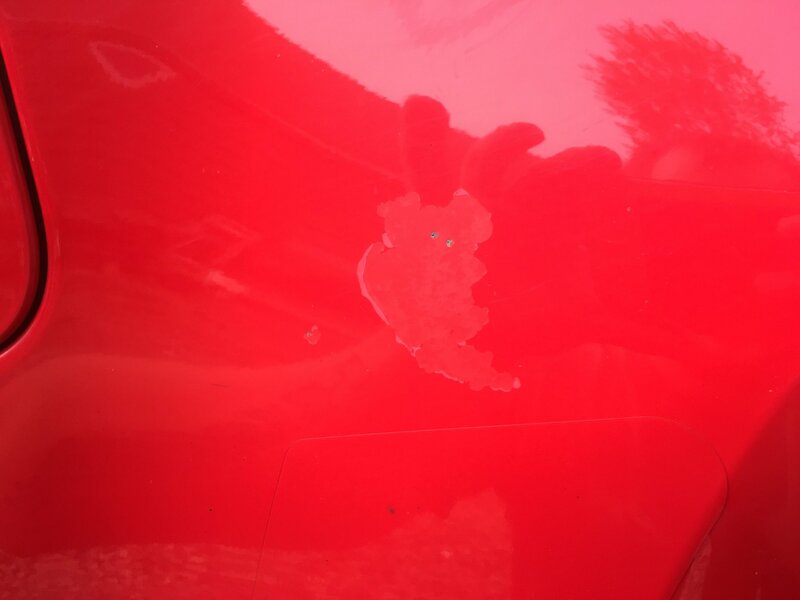 My wifes 17 mazda has almost 20 chips on bumper, hood and A-pillars, and even inner fenders and doors.. drives me nuts but I've done a lot of reading on it and it seems to be a defect in the paint. 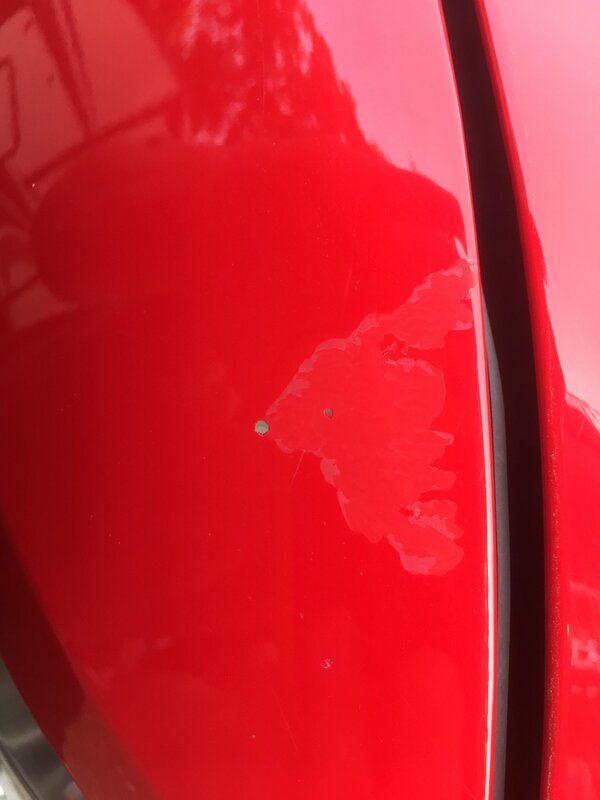 (Honda had a similar defect a while back too) most of the time the vehicles are driven too fast and/or close to other vehicles in front of it, that's the best way to chip your paint. If you dont think that's a possibility the next step would be to take it to your dealers body shop and they'll determine if it's a defect or wear and tear, if its defect they'll cover the repair whether it's a nee paint job or just touch ups. That looks like it has been repainted. Typically blend in color and reclear whole panel. New clear is not adhering to stock paint. Once chipped, water and air get in there and it will start lifting. 16WhiteColly, madcratebuilder and Alberta Beagle like this. Bought it brand new. So bad clear coat from factory? If the truck got a ding in during transport, there are facilities that repair them before it gets to the dealer or if was the final stage transport the dealer or contract shop repairs them. Yes, it is possible that a brand new vehicle has had the paint touched up. Looking at some of the marks, it sure looks like someone had a BB Gun and used it for target practice. If you do a google search, you'll see that happens way too often. In the case of BB Gun marks, they are usually round, get filled with a bit of Bondo and covered over. 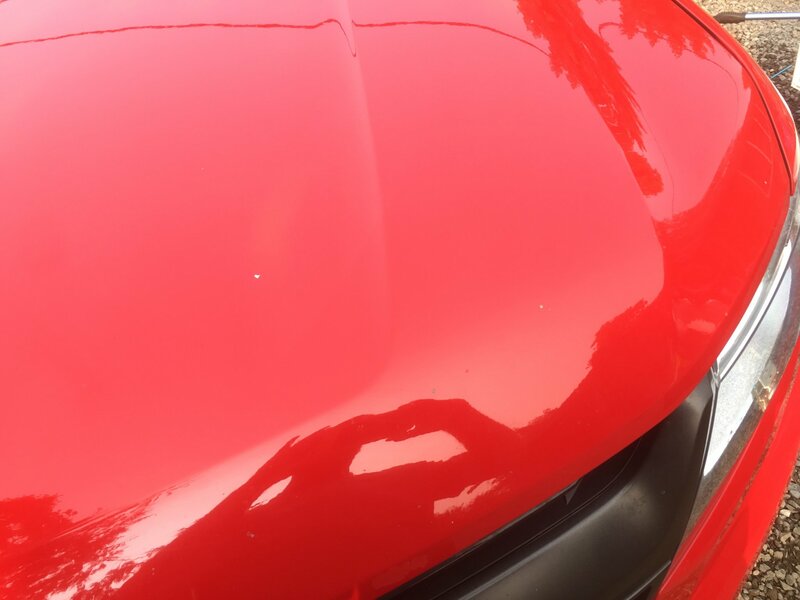 If nearly all the dings are showing signs of the clear coat peeling, then there is a good chance the clear coat is not very good. If it is only a few dings with the problem, then there is a higher probability that it was repaired between the factory and delivery to you. If it is always exposed to the sun the UV light does degrade the clear coat over time, but 3 years does seem very fast. The best way to prevent the UV light is to keep the vehicle protected with using a good car shampoo, not dish soap, and a quality wax or sealant. It was caused by the rock chips. Once you break the clear coat that lets the elements get under the clear coat and it loses the bond with the paint. Over time the clear coat starts to peal away. Only thing you can do is have the affected areas painted and clear coated. Went through this with my now semi-retired 1999 Yoto. It only gets worse the longer you wait. I worked at dealerships for about ten years and every now and then we would get a damaged rig, it would get paint repair and sold "as new". I'm about 20 miles from ducky and I don't get rock chips on any of the new GM vehicles I have owned in the past 20 years. I get scratches in the clear coat on my 17 ZR and they buff out very easily. In fact the paint on my ZR is one of the best oem jobs I've owned. 2017 Colorado ZR2 Deepwood Green Metallic, Ext Cab 3.6 DI DOHC V6 (LGZ) 8-speed auto (8L45). Midwest Overland Ind, 589 Fab, Warn, GMPP, Trifecta, Nitro Gear, Rhino Rack, Wilco Offset, Smittybilt, Ultra Ranger. Supermod Skidz. No, new cars get repainted all the time. Damage at factory, port, on/off transporters, lot boys, etc. My 96 s-10 did what your truck was doing on a door that had been repainted before I bought it new. My 2018 looks like it had the roof repainted at the dealer level. Manufacturers have body shops at their ports to fix damage and they are typically top notch. Dealers have their body shop or a local shop doing work and vary tremendously on quality. My boss when I worked at a body shop bought a new Volvo at a dealer where we did all the paint work. It had a couple doors repainted at the port. It happens to an alarming number of cars. 16WhiteColly, greco2003 and RayS like this. Interesting, but not that shocking when you consider how many times they get moved between leaving the factory and going home. Thanks for all the comments guys. I called the dealer, they said bring it in. I inspected the truck again today, it’s peeling in some areas that are dinged by rocks etc. but 1 spot on the tailgate is doing it too. It’s not dinged at all, it’s simply just peeling. I just traveled over 1200 miles of some of the worst roads in the US, and a lot of gravel miles in Canada, too. I have a few rock chips here and there, but nothing like what you have. Maybe in time the clear coat will peel. But I just didn't collect as many chips as I thought I would. As others have said I’ve only had one vehicle that the clear coat pealed on and it was repainted from collision repair Done at the Chevy dealership luckily had lifetime warranty and they fixed it. 2017 Chevy Colorado LT CCSB 2.5L 4cyl, Lazer blue with Bose, navigation, kicker vss, IBoard running boards, Z71 wheels, fog lamps, Drl relocation harness, led fog lights, high and low beam headlights, switchbacks. I would bet my next paycheck that is not factory paint and the hood has been repainted. Thicker topcoats chip easier and the peeling clear coat is from poor prep work. You could use a mil gauge to see how thick the paint actually is. Well, finally got it all figured out with GM warranty. Dropped the truck off this morning. They are doing a complete repaint of the truck. Should see it back in 7-10 days. I’ll report back as soon as I know more. But, for being out of warranty and GM doing this $8,000 quoted repair, I gotta give it to them. Good customer service! 4x4x4doors, SilverColorado2016, 16WhiteColly and 5 others like this. Wow, I'm very surprised to hear they offered to repaint the whole truck! How did it turn out? Nice! I know this last post is a few months old, but curious minds want to know how your re-paint venture fared??? Had a buddy w/F150, back in early 90's, w/similar issue. Ford repainted his truck as well.